The second edition of Tomorrowworld is underway. Thousands of people are now camping in Dreamville, with more on the way over the next three days. Union City was the last stop for many looking for last minute supplies, and the local Wal Mart Supercenter was ready. Signs pointing to tents, sleeping bags, cases of water, and beer greeted customers as they entered the store Thursday morning. Representatives from the Wal Mart corporate office were on hand to see the Tomorrowworld crowd as they shopped. Near the front of the store, a large world map (pictured right) sat beneath a banner that read "We want to know where you're from." 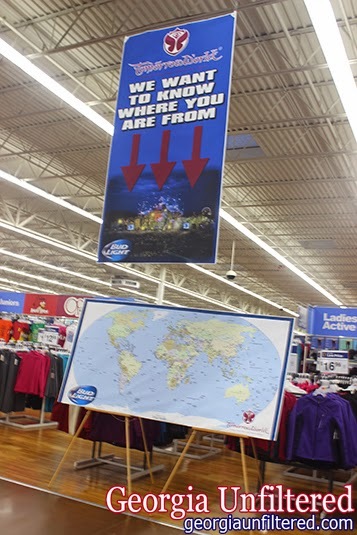 Wal Mart associates used markers to pinpoint which corner of the globe folks called home. Straight pins were placed all over, from China to the African continent.